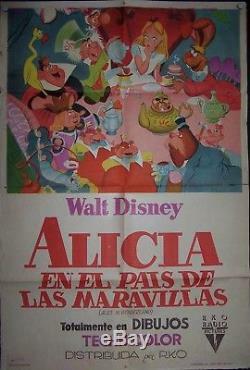 DISNEY´S Alice in Wonderland, animation, 1sheet, 1951, #10497. Original Argentina 1 Sheet (1S) poster 29 X 43, very good condition. Folded, with minor signs of use, no pieces missing, take a look on the photo or ask for further details. The item "DISNEY´S Alice in Wonderland, animation, 1sheet, 1951, #10497" is in sale since Friday, September 7, 2018. This item is in the category "Entertainment Memorabilia\Movie Memorabilia\Posters\Originals-International\1950-59". The seller is "rayorojo" and is located in Buenos Aires - Argentina. This item can be shipped worldwide.